The Solid 4 is my homage to the great man, Clarence Leo Fender. I doubt I would be speaking to you now if it weren't for Leo. Over the years I have had quite a few requests for a solid body bass. 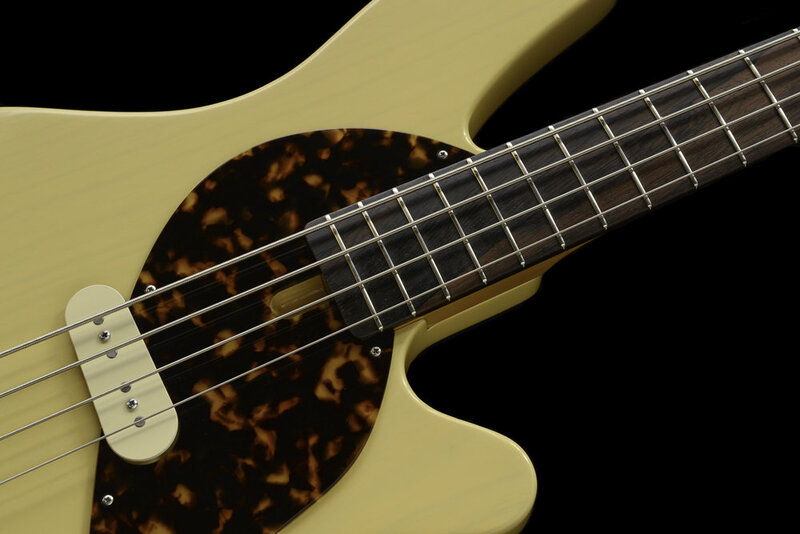 The Solid 4 is built with the same concept as my other basses; the tone starts in the wood, it should vibrate well so that notes easily flow out of it, should produces a fat tone, and have a great worn~in feel when you first pick it up. The Solid 4 is ergonomically designed with the bridge near the end of the body, creating better balance points with no neck dive, making bass that is about 3 inches shorter than most electric basses, while retaining full scale length. 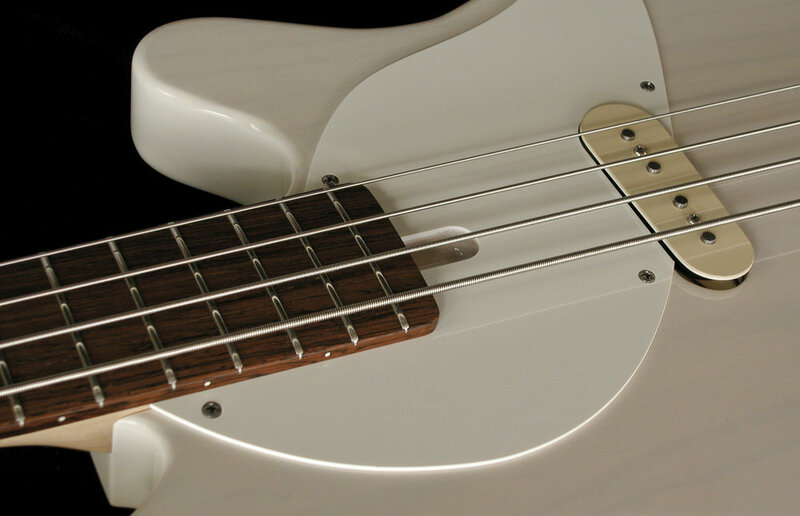 The solid aluminum bridge features no moving parts, and is inset 1/4" into the ash body, providing coupling to the wood, not to a finish film on the top of the body like most basses. The volume and tone controls are incorporated into the design of the bridge. the hardware components on the Solid 4 are original design, and manufactured in house. The thin nitrocellulose lacquer finish allows the instrument to vibrate better than a thick polyurethane finish like on most production instruments. Over time the thinners in nitro lacquer continue to evaporate, letting the finish become one with the wood. This is why finishes on basses from the 50's easily chip, crack and flake; because they have become so dry. The benefit of this is that it allows the body to resonate better. The neck is the best quartersawn rock maple. This makes a much stiffer neck than the typical slab sawn wood used on most factory (and many custom shop) basses. This critical choice of material makes for a strong punchy fundamental tone with good sustain, the lightweight swamp ash body adds the warmth. The pickup is hand wound using Alnico 2 magnets. These magnets have less string pull than Alnico 5 (the most common material) and allow for a more “open” tone since the string can vibrate more freely under a softer magnetic field (just like a 50 year old pickup would). The fingerboard edges are considerably softened, with the fret edges dressed just inside of the fingerboard edges. These creates a buttery smooth feel with no discernible fret ends. vintage sized frets, dressed slightly inside the edges of the fingerboard.